As I was looking through my Chinese New Year's books, I found one that I have managed to overlook in other years. My loss. It is beautiful. 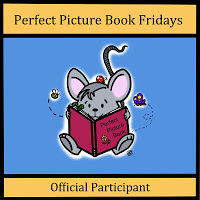 A perfect picture book for Friday. My teacher says, "Time to walk to the park." So, as always, off we go in a bunched up, slow, tight, straight line. I am last. No one else sees what I see on the sidewalk. As she walks to the park with her school class, a young girl finds a piece of string which her imagination turns into a dragons tail, an acrobat, fireworks, a storm cloud and more. 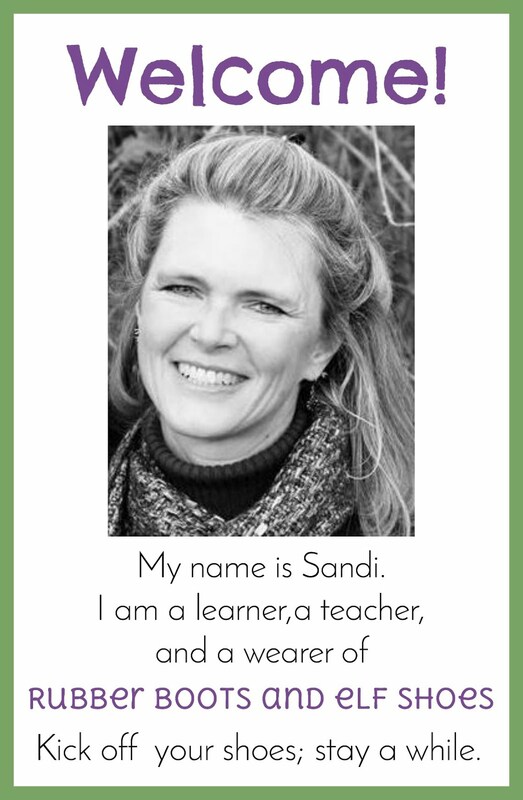 • I love books that tickle the imagination and encourage the reader to see everyday objects or occurrences from a new perspective. • The Squiggle reminds me of Except If, Not a Box, and Not a Stick, other books I love. • The text is simple, providing space for the imagination. 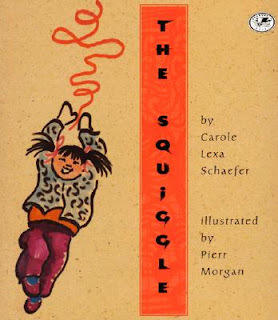 • The use of onomatopoeia allows me to "hear" the adventures with the squiggle. 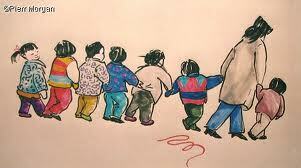 • The illustrations (markers and gouache on "oatmeal" paper), inspired by Asian brush stroke painting, clearly show the imaginary incarnations of the squiggle. 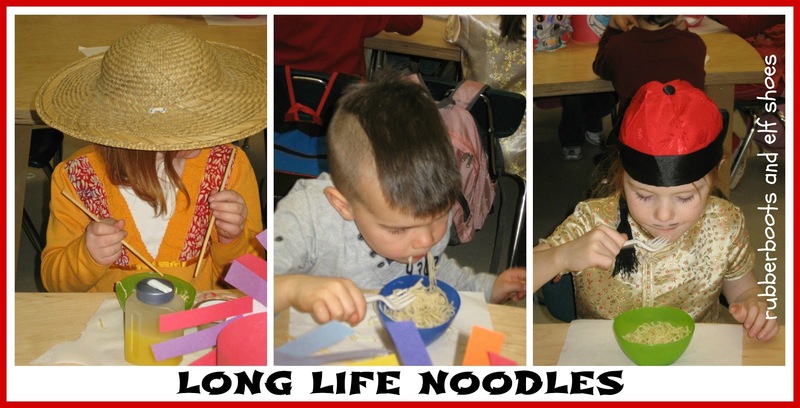 • The children are Asian; I like my classroom library to include a books that depict a variety of ethnicities and cultures. 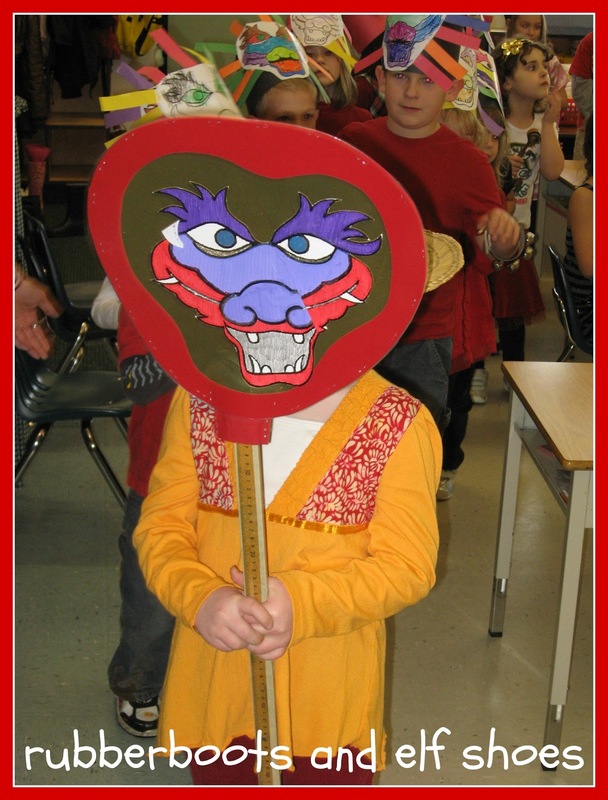 • The adventures of the squiggle teach about Chinese culture. • At the end of the story, the children are no longer walking in a "bunched up, slow, tight line". They have transformed into a joyful squiggle. This book begs for a piece of red string and time to play with it to see what it will become. 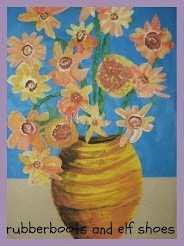 Markers, crayons or pencils could complete the picture. I see some red string in my classroom's future next week. 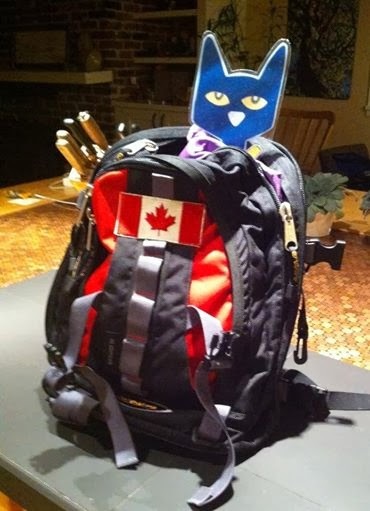 The Squiggle reminds us that going on a walk can be an adventure, not just a means of transportation (or exercise). Go on a walk, open to the possibilities presented by the imagination. Celebrate the Chinese culture presented through the illustrations. 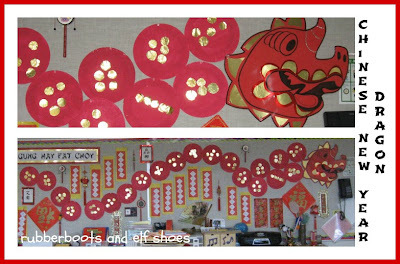 Create a Chinese New Year's dragon. 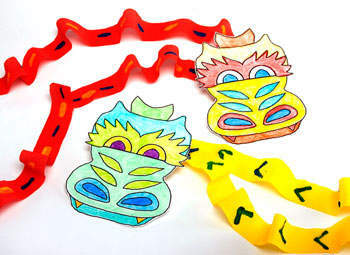 Take a dragon on parade. Happy reading and Gung Hay Fat Choy! My Amazon wishlist keeps growing (even with all the books that I buy) as a result of bloggers' recommendations. There are just so many amazing books out there. This book looks great. I never think of doing Chinese New Year *slaps hand to forehead*. Am going to check out this book. 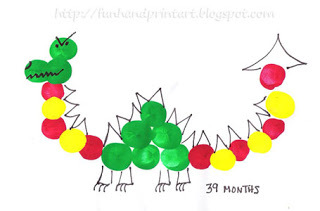 LOVE the art dragons. Chinese New Year is so much fun - lots of bling, you get to make noise and you eat long noodles. What's not to like!?!? Try it for fun one year. This looks like a lovely book. The imagination goes wild! 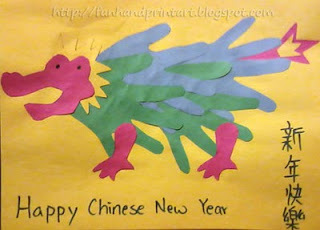 I like all your fun activities for Chinese New Year. Thanks for sharing! I like imagination goes wild books too. 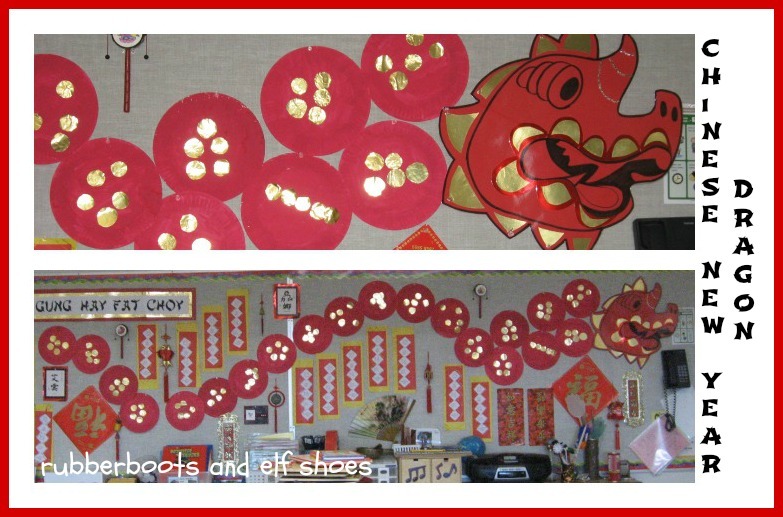 Love this post, Sandi, and all the different activities, especially the coin covered dragon. Dragons are supposed to bring good luck. Seems like a good thing to have one in the classroom. I am enchanted with your selection. 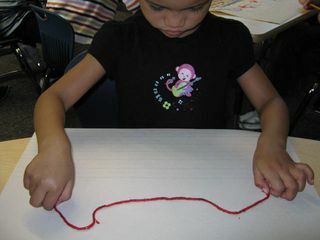 Such a creative book that encourages so much imagination -- with one little red string. And, tied into the Chinese New Year. Love you activities. Glad you added this to our list.